It is with great pleasure that we announce that Homeshare International and Shared Lives Plus have partnered to continue and develop the work that Homeshare International has been undertaking so effectively for the last twenty years. Homesharing has been in the news a lot recently, reflecting its growth across the world. This is in no small measure due to the joint efforts of Homeshare International and its worldwide network, and Homeshare UK with the support of Shared Lives Plus, the UK network for shared living. Homeshare International has supported the development of homesharing programmes in 17 different countries around the world; the charity has stimulated and undertaken research into the need for and impact of homesharing both for older householders and younger homesharers. The biennial World Homeshare Congress – now in its 10th year – was developed by Homeshare International. Shared Lives Plus is committed to Homeshare UK – and now also to Homeshare International. Over the last three years, Lloyds Bank Foundation and Big Lottery Fund have each invested £1m to expand Homeshare in the UK by funding and evaluating several local Homeshare pilots. 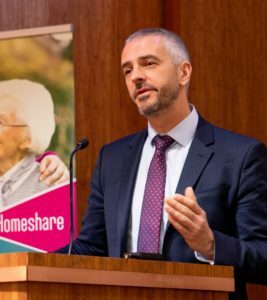 The Homeshare Programme brought funders Lloyds Bank Foundation and Big Lottery Fund together with Age UK, Shared Lives Plus, Foyer Federation and The Social Care Institute for Excellence to create a sustainable operating model for homesharing in the UK. Homeshare International was a consultant in the establishment of these pilots. Shared Lives Plus is the UK’s leading network for Shared Lives carers, Shared Lives and Homeshare delivery organisations. Through them we promote shared living across the UK, tackle loneliness and offer independence, a sense of belonging and personal choice – things we take for granted until we need that bit of extra support. 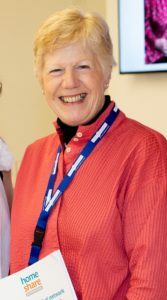 Shared Lives Plus offers a unique overview and voice for Homeshare and Shared Lives through policy, guidance, advice and legal support. Shared Lives Plus is a registered charity number 1095562. Homeshare International was established 20 years ago to support the growing network of professionals worldwide who run homeshare programmes. Its aims are to encourage learning and good practice, foster new programmes and understand the impact of homesharing. Homeshare International is committed to raise awareness of what homeshare can offer as a solution to many of society’s needs. Homeshare International is a registered charity number 1170332.